Terry Skyrme, mental health worker and campaigner, asked the commissioners whether they were aware 13 pre-discharge beds at Hellesdon Hospital were about to close. “Have you been aware of the bed crisis for the last two years? The crisis is much, much worse with patients being sent to Harrogate, Brighton, Dorking and Weston-super-mare. It is lucky if you are a patient in North Norfolk to end up in Bury St Edmunds,” he said. Commissioners pledged to work with the mental health trust to improve the performance of its Access and Assessment team after being lobbied by campaigners over concerns about the redesign of services at the NHS trust. Members of the CCG governing body added that patients being sent outside of Norfolk and Suffolk for an inpatient bed was “unacceptable”. The meeting heard that a contract query notice was issued against NSFT in November, which had been raised to a first exception report, calling for the mental health trust to put a timetable in place to deliver improvements within the Access and Assessment team. Concerns have been raised that the NHS trust is not meeting its emergency four hour and urgent 72 hour referral targets. It appears that commissioners are starting to take our campaign’s concerns seriously, even if the NSFT Board doesn’t. However, the problem isn’t just Access and Assessment and beds. There is a huge and growing problem with the slashing of mental health services in the community to people after they have been assessed and which are vital to prevent unnecessary crises and admissions. 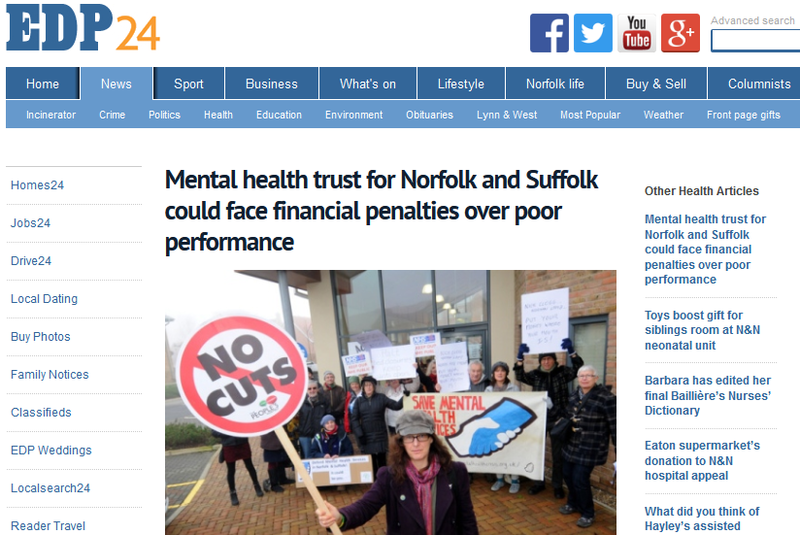 The cuts and ‘radical redesign’ have been a disaster for mental health services in Norfolk and Suffolk. Click on the image to read more on the EDP website.